Basketball positions were made up so that people who didn’t understand the game could follow it. Continuing our examination of the evolution of position in the NBA, the above quote seems pertinent. The need for positions in basketball, despite no rules governing them, is definitely a hearkening to the other major professional sports. While basketball has existed for nearly as long as baseball, football and hockey, the NBA didn’t begin officially until after World War 2. All of the other three major leagues existed in some incarnation well before, so it only made sense that the newcomer to the party add nomenclature that casual fans would understand. Centers, forwards and guards all exist in other sports, albeit with very different roles and responsibilities. Today we’re going to discuss forwards, probably the most versatile and game-changing (potentially) position in the league today. As mentioned in part 1 of this series, it’s important that we define what these positions were traditionally meant to be before we can examine their evolution more fully. This is Elgin Baylor. He is a very good basketball player. Traditionally the small forward role, known also as the ‘three’, is filled by a fantastically athletic player, capable of playing at a high defensive level but also capable of filling a scoring role. Known as one of the teams ‘wing’ players, the small forward role relies heavily on its counterpart played by the shooting guard, which we’ll discuss on Friday. Generally, one of these wing players is a more dynamic offensive player and the other is a role player who defends at a high level; this is normally due to strategy in that teams don’t want to have to share shots between their wing players but is also a symptom of the lack of available talent. Star wing players are often the focus of their team’s offense and having two focal points is something that is very difficult to balance. Another aspect of the small forwards role, particularly in the modern game, is the ability to shoot from distance. The desire for hyper athletic small forwards is growing more and more, as teams are looking for strength and speed, so that they can move their small forward to power forward and field smaller, faster lineups. As the first word in its name implies the power forward is traditionally a larger and more powerful player than their small counterpart. Also known as the ‘four’ the power forward generally plays alongside the center underneath the basket. Power forwards are expected to be tough defenders who can rebound the ball; if they have offensive skill, they can be a huge asset to a team. As the league is trending towards a ‘small-ball’ mentality, as we discussed in part 1, many power forwards are now being asked to fill the traditional center role as the team dynamic shifts. Another way teams use power forwards are to use them as ‘stretch’ forwards. Essentially, if a team has a power forward that can shoot from distance, they use that player to stretch out the defense and create space for their other players. Power forwards that can shoot are uniquely valuable commodities. Forwards have long been stars in the NBA game. From Bob Pettit of the St. Louis Hawks to Elgin Baylor of the Los Angeles Lakers, forwards were exciting to watch from the very earliest days of the league. Combining speed, size and ability, forwards generally seem like they have the body type best suited to play basketball at a high level. With centers, often it seems they’re too big and lumbering; guards are often too small. But when a forward is playing at a high level, it often seems like basketball is what they were born to do. Baylor was the first hybrid forward, before anyone even really knew what that was. He played small forward when he came into the league but was so dominant athletically it often seemed like he was a men playing with boys, which led to him being switched back and forth between the small forward and power forward role, something that is prevalent in today’s game. As the league evolved in the 1970’s, the traditional positional mindset became more reinforced, with teams playing set lineups and sticking to position. John Havlicek and Rick Barry became offensive superstars at small forward, deadly shooters and passers who ran like deer and were disruptive on the defensive end as well. Bob Dandridge became a go-to scorer for two different championship teams in Milwaukee and Washington, which were built around big men, rather than him. Dave Debusschere was a ruthless defensive specialist and helped win two championships for the New York Knicks. And of course, Dr. J, Julius Erving, electrified crowds with his high flying thunderous dunks and deft offensive touch. At power forward, the evolution was slower. Teams were always looking for centers, from Kareem Abdul-Jabbar to Bill Walton and power forwards were regarded as compliments to these. Elvin Hayes, despite his prickly selfishness (read number 4), changed all that, showing that a power forward could be the focal point of an offense and setting the tone for the future of the offensive role of the position. Two of the most dynamic forwards of all time: Bird and McHale. As the 80’s rolled around, both forward positions exploded with stars. 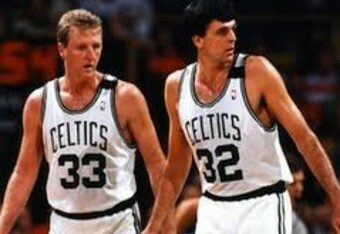 Larry Bird and Kevin McHale formed a tandem in Boston the likes of which has never been seen before or since. With their versatility, rebounding, shooting and defense (particularly McHale’s) the 80’s Celtics caused nightmares for teams in terms of matchups. James Worthy became Big Game James for the Showtime Lakers, and is still referred to as the quintessential small forward, in terms of his athletic ability. Charles Barkley and Karl Malone both became stars for their respective teams at power forward, playing the game with an athletic dominance that was hard to fathom. Barkley would run fast breaks with the speed of a Mack Truck with its brakes cut (and also fought Shaq!) while Malone developed a devastating post game with his partner in crime, point guard John Stockton. Dennis Rodman emerged in Detroit, possibly the most athletic forward to ever play the game and certainly its best pure rebounder. And in the late 80’s the Chicago Bulls acquired a forward named Scottie Pippen who would forever change the role of the position. A traditional basketball team was made up of five specific positions; center, power forward, small forward, shooting guard and point guard. The roles and responsibilities of these positions are quite fluid, which means, especially in the case of the guards and forwards, the former word in their name is also fluid. Point guards were called so because they ran point, a term borrowed from the military. Essentially they ran the plays and handled the ball to start most possessions. However, Scottie Pippen changed that role. Within Coach Phil Jackson’s complicated Triangle offense, Pippen became the first true ‘point’ forward, which allowed the Bulls to play two guards at the same time, one being a shooting specialist such as Steve Kerr or John Paxson and the other being some guy named Michael Jordan. While Pippen wasn’t a great outside shooter, his size and passing made him a unique weapon and his defensive prowess was second to none. While it’s impossible to discuss all of the great forwards to ever play the game in one article, we’ve made the bridge through the evolution of the position to the modern game. Forwards in today’s NBA are often classified by the traditional positional names but their roles and responsibilities change based on their skill set. A growing trend in basketball is to play traditional power forwards at the center position; this allows a team to play an extra shooter and to space out the floor more effectively. In Miami, after experimenting with different lineups throughout the last two seasons, Chris Bosh is now playing center for them full time. With his tremendous jump shooting ability, he pulls larger defenders away from the basket and frees up space for Miami’s elite wing players. In Boston, Kevin Garnett, a power forward his entire career, has made the move to center and is the Celtics defensive stalwart. In San Antonio, Tim Duncan played power forward in college and began his career alongside the great center David Robinson, which has led to him being called a power forward his entire career; in reality, he’s 7’0 tall and has played more (traditional) center than anything else since Robinson’s retirement, winning two additional championships since his fellow Twin Tower hung it up. An example of this positional disregard working negatively against a team is in Los Angeles, where the Lakers have incorrectly tried to pigeon-hole Pau Gasol into a forward role when he is best suited to be playing center. Dirk Nowitzki is the best shooting forward of all time and he continues to put up uncanny numbers from the field, despite his age. As mentioned previously the stretch power forward, a role pioneered by Nowitzki, is now a big part of the game, with players such as Ryan Anderson, Matt Bonner and (theoretically) Andrea Bargnani providing their teams with an outside threat from a non-traditional place. The hybrid forward role is also prominent again; Rudy Gay, in a small sample size, is winning the hearts of the people of Toronto with his ability to create his own shot. Carmelo Anthony is shining in the spotlight of New York, playing a hybrid forward role that has led the Knicks back to relevance. Our discussion of forwards eventually had to lead us to the best two players in the game today. LeBron James and Kevin Durant are head and shoulders above the rest of the league right now, though for very different reasons. 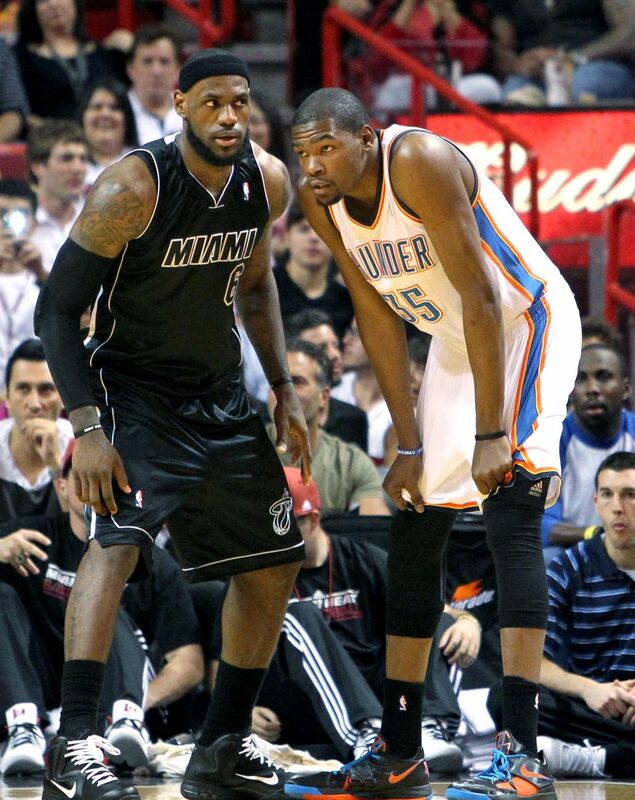 Durant is one of the best scorers in the history of the NBA, already, at age 24. On track to win his fourth straight scoring title, he combines a 6’10 frame with shooting touch normally associated with much smaller men. Due to his length and size and lightning release, he can get off his shot in just about any situation. He shoots three pointers like free throws. He gets to the line. He’s also unselfish and has worked to improve his game each year. The Oklahoma City Thunder have embraced his height and skill by playing him, a traditional small forward, at the power forward position. Few of the bigger men who play this position are able to guard him effectively (not that anyone can) and this allows the Thunder to get out and run, which is what they do best. James is a different animal. Essentially, he’s the reason this sequence of articles even exists. Due to the era-altering playoffs he had last season teams have had to change the way they play the game. 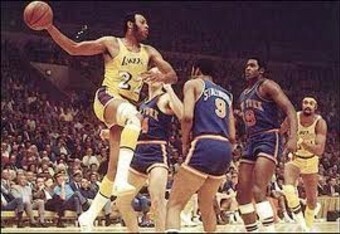 His combination of pure power, speed and intelligence is unparalleled in NBA history. While James has the athletic ability of his historical predecessors, his understanding of the game and the way he sees the floor is something that has no precedence. Essentially, he has no position. He came into the league listed as a point guard. That quickly changed to small forward, with James running the point forward role that Scottie Pippen created and nobody had been able to play since. As he moved to Miami, James developed a post-game, starting to play inside and take higher percentage shots, becoming an efficient machine. Last night, he set a record as the only player in NBA history to have six straight 30 point games where he shot more than 60% from the field in each. It’s unclear at this point if he’s actually a human. The term ‘power point guard’ has been bounced around in reference to the role he plays with Heat. It’s a term that makes sense but the truth is that you can’t classify what James does with a positional role. He essentially just needs one so we can vote him into the All-Star game. Speaking of which, it’s time to look at our best performance from a forward in all-star history! I don’t have much to say about this one. Just watch this and this. Two eras. I’ll give you a hint. One of them is a white guy with a feathered hair-do going bananas in 1987 and the other is LeBron destroying his peer group.